Physical characteristics: Striated pardalotes are the largest of the pardalotes. They are small, brightly colored birds that are easily identified by the bright yellow patch above the eyes. They have considerable variation in plumage characteristics across the geographical range of their species. All birds have white eyebrows, olive-gray backs, and a white stripe on the wings. In different parts of the country, the wing stripe may be narrower or wider, the colored spot at the front end of this stripe may be red or yellow, and the black crown (top part of the head) may have narrow white stripes. Both male and female are similar in plumage. They are 3.5 to 4.5 inches (9.0 to 11.5 centimeters) long and weigh about 0.42 ounces (12 grams). Females and males are similar in plumage, but juveniles are much paler, particularly on the crown and face. Geographic range: Striated pardalotes are located throughout Australia except for desert sections of the interior of the country. Like other species of pardalotes, they are found only in Australia. Habitat: Striated pardalotes are found in almost every territorial habitat that contains trees or shrubs. They are widely distributed through woodlands and forests filled with eucalyptus, but are also found in rainforests and mangroves (tropical evergreen trees of tidal coasts). They often are found near and about water courses. Diet: Striated pardalotes eat a number of invertebrates, including insects (and their larvae [LARvee; active immature insects]) that they pick from the surfaces of foliage in the tops of trees, such as outer twigs and leaves, mostly from eucalyptus and acacia trees. They sometimes come close to the ground and feed among low shrubs. Feeding takes place in small groups, with the birds maintaining contact with each other with soft sounding trills. Behavior and reproduction: Striated pardalotes are very active and curious in their overall behavior. They form flocks of birds during winter. Some species are nomadic or migratory, while others tend to be sedentary (tending not to migrate). They do not defend their breeding territory, except for the immediate area surrounding the nest. They are loud sounding birds with a repetitious two- to three-note call, such as the "tchip tchip." When not breeding, the birds form flocks that feed together. While feeding they utter constant, short calls. The breeding season takes place between the months of June and January. They form breeding pairs or small groups of up to six birds. Striated pardalotes build nests close to the ground, often in earthen burrows, or in tree hollows or tunnels. They sometimes use artificial objects built by people for their nests. The completed nests are cup-shaped, either partially or completely domed. They are made with plant fibers, such as tree bark and grass, and lined with finer materials. Nests are located at the end of a tunnel, or in a tree hollow. The birds appear regularly at the entrance to the nest, aggressively guarding the area around the nest from other pardalotes and predators. 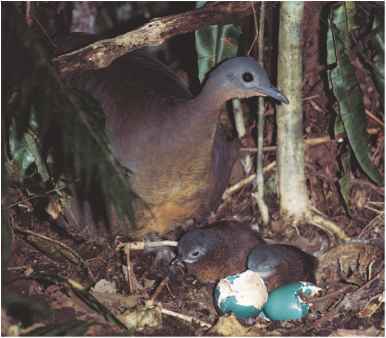 Females usually lay three to five white eggs, which are incubated by both the male and female of breeding pair. Other members of the breeding group also help with feeding the young. Striated pardalotes and people: People and striated pardalotes have no special relationship between them. Pizzey, Graham. Field Guide to the Birds of Australia. Sydney, Australia: Angus and Robertson, 1997.